Xi'an North Railway Station is one of the most important transportation hubs of Chinese high speed rail network. It is about 8.7 miles (14 km) from Bell Tower (city center), 8 miles (13 km) from Xi'an Railway Station, and 15.5 miles (25 km) from Xianyang International Airport. North Railway Station mainly operates bullet trains to/from major Chinese cities including Beijing, Shanghai, Guangzhou, Zhengzhou, Wuhan and Changsha. The North Train Station mainly consists of two parts: two squares and station building. Currently, only the south square is in service and the north one is under construction. Public bus stops, taxi stands and parking lots for personal cars are available on the south square, and beneath the square, there are also parking lots in service. In the future, there will be a commercial plaza and a long-distance bus station beneath the two squares, too. Between the two squares is the station building, covering an area of 83 acres. It is modeled in the architectural style of the Han Dynasty (202BC – 220AD) and the Tang (618 - 907) Dynasty, which indicates long history and rich culture of the city. The building has four floors: two departure floors 1F & 2F are above the ground, and the other two are under ground. -1F is an arrival floor and -2F is a subway station. How to get to Xi'an North Railway Station from downtown? Passengers arriving by bus will get off at the south square. For those with a ticket in hand, enter the station directly to find a seat in the right waiting area on 2F. For those without, the ticket offices are located on 2F, 1F and -1F respectively. Passengers can go to the most convenient one to buy tickets and then enter the waiting hall. North Station is the last stop of subway line 2. Passengers will arrive at -2F of the station building. From there, there are escalators, lifts, and stairs to upper floors. The subway line 4 will arrive at the North Square of the railway station. From there, there are clear English signs to help go to the North Railway Station. Passengers arriving by taxi will be dropped at the drop-off area on 2F. Before checking in, passengers should read their tickets carefully to know exactly where to have the tickets checked. North Station is equipped with self-service check-in machines. If the tickets are blue, passengers can check in by swiping the tickets. But if the tickets are pink or you have large luggage, they need to have their ticket punched by the station staff at check-in points. Check-in usually begins 30 minutes before departure and stops 5 minutes before. Then, take escalators or stairs down to platforms on 1F for boarding. Upon arriving, all passengers are led to the transfer hall on -1F to exit. Passengers should confirm their routes and decide how to leave the station first and then find bus, taxi or subway to their destinations following the direction boards. 1. The subway entrances for line 2 are located on the same floor with transfer hall on -1F. Passengers can find them easily upon arrival by clear signs. 2. Walk to the North Square of the railway station. Then follow the signs to take subway line 4. Bus stops are located on the south square. Taxi stands can also be found on the south square. Passengers can go there to take taxi when they confirm their routes. Take subway line 2 to North Street, change to line 1 to Wulukou, then walk northward to get there. Take subway line 2 to Bell Tower. Close to Bell Tower, one can also walk to visit the Drum Tower, Muslim quarter and Great Mosque. Passengers arriving at the station can take a free shuttle bus to the site directly. However, they need to buy the entrance ticket of Terracotta Warriors first at the Tourists Service Center on -1F of the station. When getting onboard, both railway ticket and entrance ticket are required. The bus leaves North Station from 08:00 to 16:00 and returns from Terracotta Army from 10:30 to 19:30, both with the interval of an hour. Duration is about an hour. Take Airport Shuttle Bus Line 6 to get there directly. The bus is available from 08:00 to 21:00 every 20-30 minutes. It takes about 40 minutes on the way and costs CNY25. Take metro line 2 to Fengqiyuan metro station first and then change to bus no. 918 to the South Station. Take a train to Huashan North Railway Station. After getting out from the station, take sightseeing buses 1 or 2 close to the exit and get off at the Tourism Center at the foot of Mt. Huashan. Take subway line 2 to Yongningmen (South Gate) and get out from exit C. After, walk northward to ascend the City Wall. Take subway line 4 and arrive at Giant Wild Goose Pagoda directly. Two ticket offices, located at both sides of the entrance on 1F, are open from 05:30 to 24:00. The special windows for ticket change and refund are located inside the office on the east side. In addition, the ticket office on south side of -1F will be opened in peak travel season. It is located on 2F of the terminal building. Upon arrival, find the specific waiting area and check-in barrier according to your ticket. There is also a mezzanine on this floor, which is a shopping and dining zone including McDonald's, KFC, Daniang Dumplings, Mingtien Coffee and UBC Coffee. Special local products and handicrafts also can be found here. There are 56 call buttons scattered around the waiting hall, so passengers can ask for help when they come across any problems. On east and west sides of the hall, scatter toilets and hot drinking water rooms for passengers' convenience. If you have luggage to store at the station, you can go to the customer service counter on 2F. It charges CNY 3 for small bags (less than 22 pounds) and CNY 5 for large luggage (over 10 pounds) per day. Luggage carrier service counters are located at the entrances of both first and second floors. The carriers can send the luggage onto carriage for you. The service fee is CNY5 per piece of luggage and CNY50 per cart. Everything was great, thank you. Reliable booking, helpful staff, successful delivery and receipt of tickets. No problems at the station at all. Stations were modern and airy, trains ran to time, and first class carriages were comfortable and spacious. Only one complaint (not related to your company! ): the Chinese businessman who thought it was appropriate to spit in the air con grill next to his seat!! Uurgh. We would definitely use your service again - thank you very much! I have used Travel China Guide for all of my China travel and have found them to be very responsive and professional. I will continue to plan my train travel with them in the future. The service you provide is exelent and smooth. It can all bee done on the internet. I experienced the booking procedures with you as a pleasure. I received replies quickly and accurately. I was glad you notified me when I had made a mistake in the information I had to provide and you helped me fixing this mistake. The train journey was fine. Everything was clear. Overall you've gained a very statisfied customer and I'd recommend your organisation to everybody as a high service company with good prices. This is the third time I have booked trains using the travelchinaguide.com service and have been very satisfied. I greatly appreciate the letter to print with the Chinese translation to allow me to pick up my tickets. My only complaint about my train experience was standing in line for 45 minutes to pick up my ticket. That was the train station's problem not the booking service. 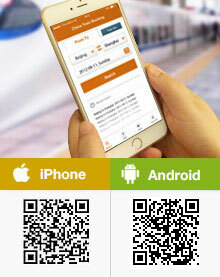 I plan to continue using the train booking service. Your service was very good and on time. We received tickets for all trains just arrived at our hotel in Shanghai. Excellent directions to arrive at least 30-40 minutes prior to departure, visas multiple inspections. I think you should first inform passengers that tickets are not to be included in the turnstiles, but show the station staff. Another essential thing would be a sheet with the map of the location of the station. For example, we have confused the station of Xian with Xianbei and given the distance between the two stations we have requested a refund for our trip to Luoyang Longmen. Which train should I take to the Wild Goose Pagoda? I have a hotel booked near the Wild Goose Pagoda. The hotel is Hampton by Hilton Xi'an. In fact you can take metro line 2 to Xiaozhai, exit F. Then take bus No. 24 to the South Square of Wild Goose Pagoda. The hotel is about 250m away. Or you can take line 2 to Weiyijie, exit C. Then you can walk 1.5km to the hotel. Or you take metro line 4 to Datangfurongyuan and then walk to the hotel, around 1.1km. hello, i am planning to take Z75/Z151/T7 bullet train from Beijing to Xi'an on 26 December 2018. will i be eligible to take free ride to terracota army site? please advise the procedure, whete to take the free transportation, how to get there and to return back to Xi'an North railway station. thank you. Your mentioned trains are not bullet ones. You should take the G train from Beijing west to Xi'an north, then you could take free shuttle bus from north station to Terracotta Warriors and Horses Museum. Ok thank you for your info. How can i get to Terracotta army from Xi'an North railway station by public transport and how much does it cost? Xi'an Railway Station is on which station in Subway line4? The first station for Subway line4 is Beikezhan (North square) and last station is Hangtianxincheng. I can't find any Xi'an Railway station along the Subway Line4? Thank you. I am planning to visit the Terracotta on the Sep 7 and at the same time, I have bought a high-speed ride ticket to Shanghai from Xi'an, departing Sep 9. Will I be entitled for the free shuttle bus service? I read that you need to hold a ticket on G rides that arrivs at this station on the same day you visit the Terracotta. So you can only use the free bus service if you have a ticket reach the station on Sep 7. From Bell tower to Airport......how to go?. Guide me. Oh, it can work the same way. You can take the metro to North Railway Station and then take the airport shuttle bus to the airport. You can also take a bus or taxi to Longhai Hotel near Xi'an railway station first and then take the shuttle bus to the airport. Could you please guide me, how to reach the Xi'an Airport from Bell tower?